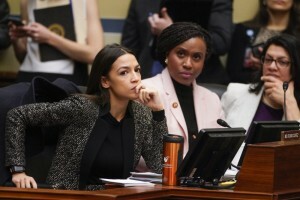 From Chairwoman Maxine Waters (D-CA) to frosh Reps. Ayanna Pressley (D-MA) and Katie Porter (D-CA), the House women pushed powerful CEOs to acknowledge their failures to adequately address lending discrimination, income inequality, and consumer abuse. Pressley cited studies showing Black women were 256 percent more likely than White men to receive subprime mortgages from the big banks in the run-up to the financial crisis. Waters elicited admissions that simplifying their complex banks has improved management. Porter demonstrated to JPMorgan Chase CEO Jamie Dimon that a single mother could not possibly make ends meet while working a starting job at his own bank. Meanwhile, Rep. Madeleine Dean (D-PA) got Bank of America CEO Brian Moynihan to admit that he’s never even sat through one of his own bank’s excruciating mortgage modification process. Rep. Nydia Velazquez (D-NY) called out Citigroup CEO Michael Corbat for earning $486 for every $1 his median employee earns.